History needn’t be a dull, dry static dead thing locked in the past. Many times history ripples vibrantly forward right into the present, echoing out of the past with a roar that commands attention. Such is the case of René Arena (née René Kirchheimer). 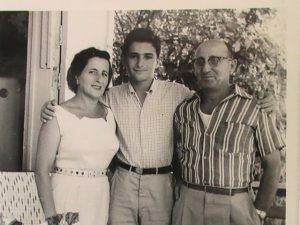 René’s parents, Arthur and Ilona Kirchheimer, were among the first wave of Jewish refugees to arrive at the new immigrant colony that was set aside by Rafael Trujillo in the 26,000 acres of abandoned United Fruit banana plantations that would become Sosúa. Arthur would soon come to be known as “Arturo el Simpático” (Arthur the friendly) by the Dominican locals. Illona or “Loni” as she was known by everyone, was Lutheran, not Jewish. Due to the Nazi regime, and anticipating the worst, Arthur went to Luxembourg (where the Nazis had not yet arrived) with a friend who had a Volkswagen. There he received training in livestock and agriculture because he had worked for two years on a farm. These skills were exactly what would be needed in Sosúa and would play an important role in the development of the colony. Arthur and Ilona got married secretly in the city of Luxembourg, by a civil judge (in Luxembourg without knowledge of the Germans, who were already working in administration). After the intense persecution by the Nazis, Arthur and Ilona were left with no choice but to make the perilous, incredibly difficult and unimaginably uncomfortable multi-national transatlantic journey to the Dominican Republic. They settled into their new lives as farmers in the tropics, clearing land and planting crops with much success. 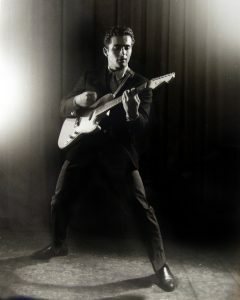 Their son René was born in Sosúa in 1942. From 1942-1943 Arthur would drive a horse cart 30 kilometers from La Atravesada to Puerto Plata. Two to three hours later he would reach the warehouse he’d built in Puerto Plata, the house of Pedro Leroux, in front of where the Palace of Justice stood at the end of the ‘80s. At this warehouse, he would sell preserved and fresh vegetables, cheeses, and sausages. 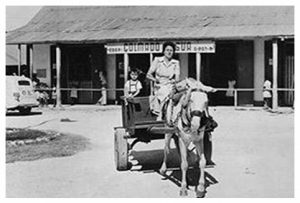 He called this store, “Productos Sosúa.” It is still a major dairy and meats concern today. Arthur acquired a slightly damaged (as the story goes; it took three times as much to repair it as it did to buy it) Buick from the American manager of a chocolate factory in Puerto Plata and became the first person in Sosúa to have a car. He learned to drive and soon began running passengers between Sosúa and Puerto Plata as well as neighboring towns and even to the capital in addition to driving his agricultural cargo to his Productos Sosúa. One afternoon during a routine traffic control stop the police officer asked Arturo his name, to which he replied “Arturo Kirchheimer.” The policeman had a hard time pronouncing or spelling Kirchheimer so Arturo just said OK; “Arturo Sosúa” and the name stuck. Kirchheimer had noticed that the local Domincan pigs suffered from a genetic weakness caused by years of inbreeding and began buying a few pigs from Jamaica, Bahamas, Martinique, and other islands to improve his stock. When the war ended in 1945, he imported two pairs of Poland China and Berkshire pigs from the USA and started breeding pure pigs. He had great results and went on to produce the best pigs on the island. He also had great success with purebred cattle. Due to these successes, he was asked to do the same in Santo Domingo. At that time the city was called Ciudad Trujillo. In 1954: Kirchheimer organized a big national fair for the entire country, and many farmers brought their best animals, cows, pigs, horses and other animals. Kirchheimer entered 72 heads of imported breeds – a thing not seen before by anyone in the Dominican Republic up to that point. Arturo had swept nearly all the awards; even Trujillo visited and asked him how he had this fantastic result with breeding and if they were imported. Arturo explained there were two pairs imported, and all the others were born in Sosúa. Trujillo embraced Kirchheimer and confided that the immigration of Jews from 1940 to 1941 was a very positive thing and that if there were more Jews like Arturo, the country would progress ahead. Kirchheimer thanked him and sent a breeding pair of prized pigs to his farm. As a result of the outcome of the fair, an international fair was formed in 1955. Arturo attended with 80 pigs. In 21 fairs in other cities, he received as many as 150 trophies. In addition to all of his accomplishments in agriculture, Kirchheimer also connected with the German embassy and the ambassador and became the assistant and representative of the Botschaft (German embassy). As such, he ensured that all of the German Jewish colonists of Sosúa received compensation, reparations or repayment for the loss of former assets and valuables according to the laws of Germany. They were also entitled to receive income payments as employees, which were incurred prior to the Hitler regime. Under Arturo’s dutiful administration, all settlers from Germany received repayments or income due. He also served thirteen ambassadors for 42 years, and for his efforts, he received an honor in 1989 when German President Weizsäcker awarded Kirchheimer Order of Merit in First Class and Golden Cross. Arthur Kirchheimer was the only Jew at that time who had received this award. Arturo even had a hand in the creation of the Sosúa tourist industry in that a 1980 documentary was made in which he appears, it was transmitted in Germany titled “A German destiny” (Ein Deutsches Schicksal), it had been viewed by the masses, received a great rating and, as a result, many Germans arrived in Sosúa giving rise to tourism from Germany to Sosúa. René spent his earliest days on the farm in the countryside a few miles outside Sosúa town on the way toward Cabarete. When he was around ten-years-old the family moved to the Batey to be nearer school and so Loni could be more socially connected and active as many of the settlers were living there. Due to concerns that his young rebellious son might stray into trouble with the Trujillo resistance, Arturo sent the 14-year-old to go live with his half-sister Hanna, who was married and living in New York. René was very excited about going to high school in New York. It was in the vibrant musical club scene of the Village that his artistic interests were awakened. But René was a steadfast student and kept at his studies. In 1964 he joined the U.S. Navy. Ever the academic, he continued to study in the university while learning aircraft maintenance in the Navy. Upon completing his military service in 1968 René returned to the Dominican Republic to work in the national flag airline, Dominicana de Aviación. He was licensed by the FAA (Federal Aviation Agency). The Dominicana de Aviación fleet received maintenance from Eastern Airlines, so he had to travel to Miami, Atlanta, and New York to receive the planes, after maintenance. With a specialty in the administrative area, René then worked as a maintenance manager for two years for the company Air Panama with a seat in Miami. That was while the CDA closed temporarily. When it reopened, he went back to work at CDA (Dominicana de Aviación). In 1980 René returned to Sosúa to work with the Tourism Secretariat in Puerto Plata as Public Relations Officer for that department. When the new Puerto Plata airport opened, he worked as a station manager for Air Florida. Returning to the tourism sector, René bought Restaurant la Roca, with two German partners from a Mr. José Muñiz. Restaurant la Roca featured the first proper discotheque in Sosúa. He headed back to New York in 1989 working for Wendy’s as a co-manager. After a year René felt the pull of the island calling him home. 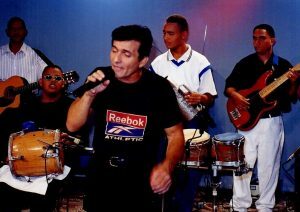 Returning to Sosúa in 1990 he accordingly launched the Bachata-fusion Arena music group which achieved much success and for which René is still recognized today. He also worked as manager of Melissa Tours, organizing tours for Samaná, Jarabacoa and Río San Juan for the many Canadians and German tourists who came at that time. 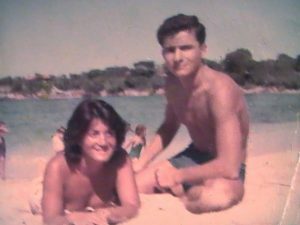 Twenty-nine years later and you will often find René looking fit, spry, and a good twenty years younger than the 77 years that mark his time on Earth, sitting at a favored cafe in the middle of town. Strategically retreating to the best shaded areas under the awnings, sheltering from the afternoon sun talking about how things were, how they are, and how they could or perhaps should be – offering some workable solutions to the challenges. René Arena Kirchheimer is still very much a man on a mission: a mission to preserve a legacy, a heritage, and a legendary history of a town whose history he and his family are vividly a part of. René found a kindred spirit recently when ex-pro baseball player, history and cultural preservationist, and founder of Sosúa75, Hugh Baver came to town and asked René to speak at the Royal Hotel in Evían, France at the first official commemoration of the Evían Conference of 1938, the conference which resulted in his parents’ immigration to Sosúa. With Renéwed passion and energy, René is doing his best to revive the recognition of the Jewish history and contributions to Sosúa and to continue to express thanks to the country that gave his people a home when no others would or could. He has recently begun to think about playing music again and is working to find ways to create and encourage more unity within the community – perhaps through his next musical adventure. Sitting at the cafe watching a soft parade of various members of the community stop, chat, and shake the very personable and smiling René’s hand, one gets the feeling that the history and town of Sosúa have a very bright future.